Hall of Fame member AWESOME AGAIN has fashioned a breed-shaping sire career. He has already sired nine U. Awesome Again is the "best sire in the history of the Breeders' Cup." S Grade I winners, eight from his first four crops. He has also sired four Breeders’ Cup winners from just nine starters, and at his young age, is poised to overtake Storm Cat and Sadler’s Wells by total Breeders’ Cup earnings. This Awesome Again colt is out of the speedy Relaunch mare INSTORE, a sprint winner coast to coast. 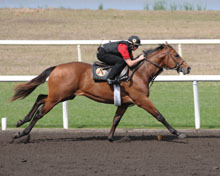 Instore’s first foal is a Track Record-setting sprinter. 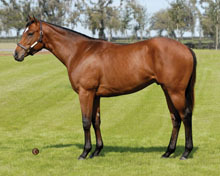 Both of her full sisters have produced Graded stakes winners, including a Grade I winner by a son of Deputy Minister. 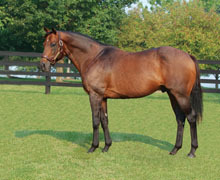 Relaunch is broodmare sire of 96 stakes winners, most notably Horse of the Year Ghostzapper. And Awesome Again has had his best overall success with mares carrying In Reality. Nearly 30% of his stakes winners and 20% of his stakes horses are out of mares that have In Reality within five generations.